Unfortunately sometimes leaded and stained glass panels get broken or due to a mixture of age, weather conditions and circumstance need completely re-leading. Holme Valley Stained Glass offer a range of solutions to these problems. Single or multiple breaks to a leaded panel can in most cases be repaired in-situ without removal of the entire panel. 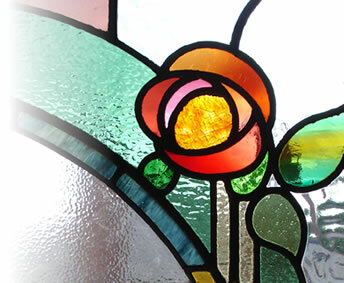 Holme Valley Stained Glass prides itself in being a specialist in this field of work. With a vast range of antique re-claimed glass in stock it is possible in most cases to match the broken pieces with a like for like period glass otherwise a nearest match policy is employed using modern equivalent glass. If there are too many breaks or the panes lead structure is too damaged and weak then a full or partial re-lead is required. The panel is carefully removed and the frame is temporary glazed with glass or boarded with wood. The panel is then taken back to the workshop where its details are recorded, then completely stripped, cleaned and any broken pieces re-cut. The panel is then re-built, lead cemented, polished and finally refitted for you to use and enjoy again. For a free , no obligation quote or for further information on any repair or restoration work you may have please contact by phone or use the contact link above.